Oil price strength and a rebounding S&P 500 provided a positive backdrop for midstream this week, and midstream stocks traded up. 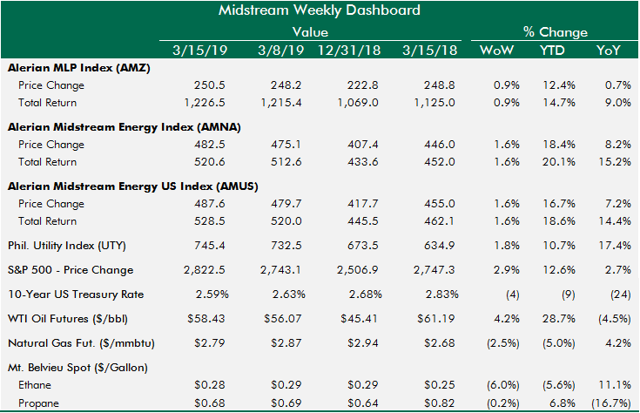 The Alerian Midstream Energy Index (AMNA) closed the week with a 20%+ total return for the year. EQM led all MLPs this week, after trading up early in the week and after its asset acquisition announcement mid-week. All midstream corporations were positive this week. Canadian Midstream had a solid week of tightly bunched returns. Oil price strength and a rebounding S&P 500 provided a positive backdrop for midstream this week, and midstream stocks traded up. With little stock-specific news, gains can largely be attributed to the good kind of correlation to oil prices, income-oriented equities and the stock market. Within midstream, MLPs underperformed midstream corporations and Canada. The Alerian Midstream Energy Index (AMNA) closed the week with a 20%+ total return for the year. 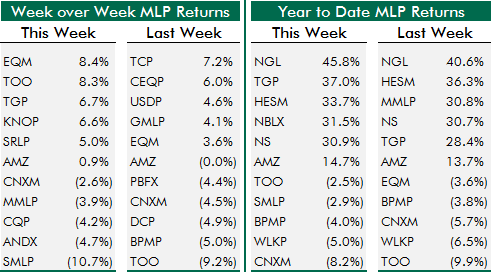 The MLP Index is losing to that index by more than 500 basis points YTD and year over year. It has also been exactly one year since the initial FERC policy announcement on tax allowances that sent the sector down 5%. The MLP Index value closed at 248.8 that day, and that's right about where the index is today. It has hovered around that 250 level since early January after the snapback to open the year. Midstream has produced 15-20% total return so far this year. Oil prices have rallied 29% this year. A skeptic could attribute midstream gains to the rebound in oil prices and little else. In speaking with investors evaluating their existing midstream exposure or who are considering adding, oil price correlation remains a key area of concern/risk. My response to those concerns is usually the anecdotal contention that oil prices should not be a headwind for midstream stock performance as long as oil prices are above $50/bbl. That has been the magic number where it feels like midstream buyers disappear and there is not appetite for midstream stocks. The below chart is an attempt to add some meat to my contention. The black line is $50/bbl, the blue line is oil price, and the red line is 90-day rolling correlation between oil prices and MLPs. 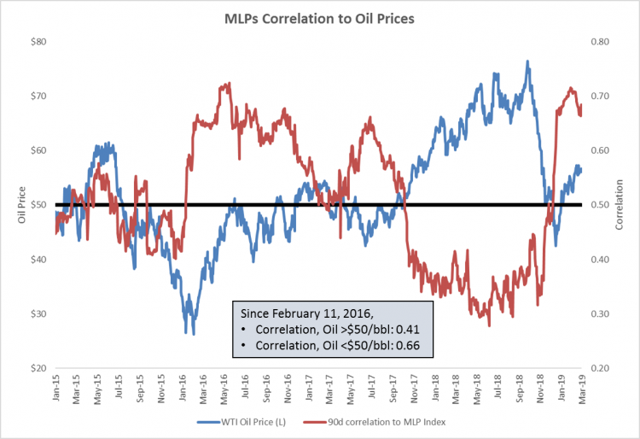 The chart shows that when oil prices trade below our arbitrary $50/bbl number, correlation between MLPs and oil prices spikes. We've seen midstream trade with lower correlation to oil prices when oil prices are trading well, sometimes to the detriment of midstream stock prices. Recall how frustrating it was last year to watch midstream stocks struggle even as oil prices broke through $60/bbl. I frequently hear investors lament that MLPs are only correlated to oil on the downside and they don't benefit on the upside. That may be true in recent years, but if oil can hold and establish a more comfortable range above $50/bbl, midstream and MLP stocks may be able to produce uncorrelated positive returns relative to more stagnant oil prices. Collectively fund $40-50bn in growth capex via self-funding and asset sales (and little equity capital markets access). Generate attractive returns on capital. Trade well even if oil prices are stagnant. Incremental investors see value in midstream, but remain concerned that there must be a reason valuations screen so attractive. And while a secondary reason may be the "problematic" nature of fossil fuels in an increasingly ESG world, the primary reason is the execution gap above, which can be bridged this year. EQM led all MLPs this week, after trading up early in the week and after its asset acquisition announcement mid-week. 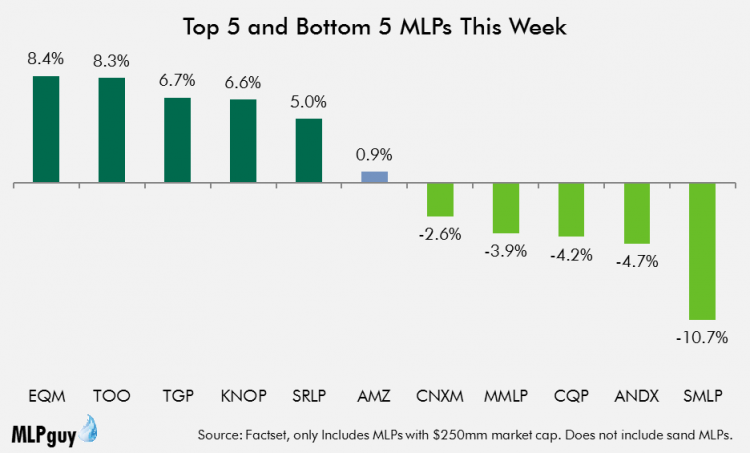 Shipping MLPs outperformed likely on strong oil prices. SRLP maintained its distribution (for now) and was rewarded Friday. SMLP was the biggest loser, continuing its tailspin after announcing a number of strategic moves with earnings. EQM repeated in the top 5, and TOO went from worst last week to second this week. CNXM repeated in the bottom 5. On the YTD leaderboard, TGP climbed into the second spot, NBLX replaced MMLP in the top 5, and all 5 have produced 30%+ returns. In the bottom 5, TOO made a big jump from the bottom spot. CNXM took over the bottom spot. All midstream corporations were positive this week. ALTM found some value buyers this week and led the group. New AM (AMGP) caught a bid after finally closing its simplification. ETRN (see EQM above) traded well. KMI was the worst performer, taking a break from the weekly lead, but still trading up. 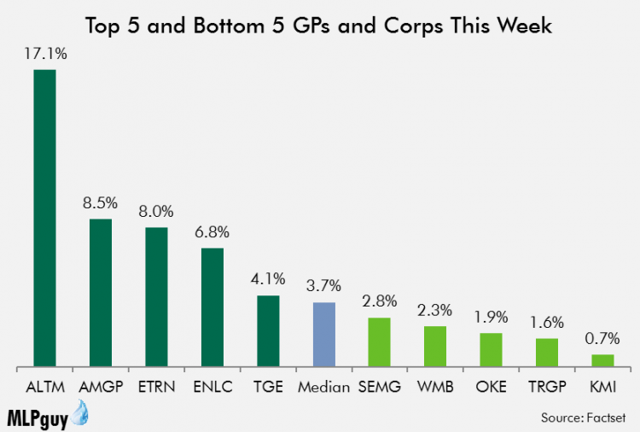 Again, midstream corporations far outpaced MLPs on average. ETRN and TGE repeated in the top 5. 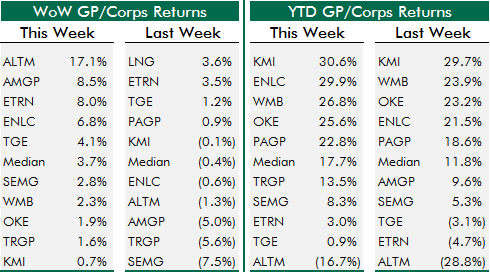 On the YTD leaderboard, ENLC closed the week just under KMI at the top of the sector, and WMB and OKE are not far behind. ALTM is now the only negative stock in the group, and New AM was replaced by TRGP in the bottom 5. 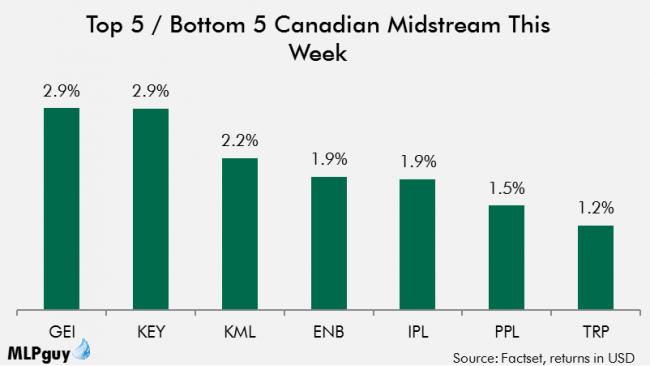 Canadian Midstream had a solid week of tightly bunched returns. Smaller names slightly outperformed; ENB finished slightly better than TRP. GEI led the group for a second straight week. On the leaderboard, Keyera (OTC:KEYUF) broke 30% and has separated a bit from the rest of the group. Texas Spring Break week did turn out to be quiet for midstream companies based in Texas. But several non-Texas midstream companies had news, including EQM and OKE. Private equity were the sellers (for a change) in the EQM transaction and one other M&A deal this week (selling to another PE firm). Also notable, as the market looks to develop a wave of new VLCC-capable oil export facilities off the Texas coast, one of them hit a snag. AMGP shares will no longer trade and the new corporation began trading under the ticker "AM"